I noticed this earlier as well and found that the CCC facebook page is gone too - looks like it's finally become Canadian Endurance Racing. That was a crazy weekend for us. As @KSRD pointed out, we weren't even there and we had major issues. We managed to get everything figured out and eventually made it home yesterday morning. As for the track, what a fantastic facility - my first time there and I got to do the 7-9 into darkness stint and WOW that was a crazy stint for a noob. I stayed clean and on track, and I just hope that I was predictable enough for you experienced guys that were able to get around me. Certainly a new experience on many levels, and I can't wait to try it again. 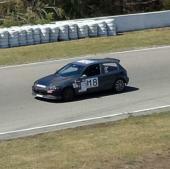 Thanks to the ChampCar and VIR staff and volunteers for hosting a great event. As well as the team who lent us the hoist, and the #940 Volvo team for their drain pan, which I left in the passenger seat of the car. My first trip to the Glen and a US Champ race. Very well run, with great people and great racing. Thanks to everyone. No Doom Cruiser? Sad to hear. I always enjoyed those last lap battles you guys had with the other teams. FTD - fastest time of the day. I've heard stories about Nationals where some drivers bring two new sets of tires, one set for each day. I would imagine the serious guys are doing whatever it takes to win, so if that means many new tires ... I guess you could say the same about Chump. Thanks! Both cars got pretty beat up by the end of the season, the #18 more so, haha. That car has been through hell and back yet ran so strong last season with only a few minor mechanical issues. At the moment, no, but that could change as the season progresses.